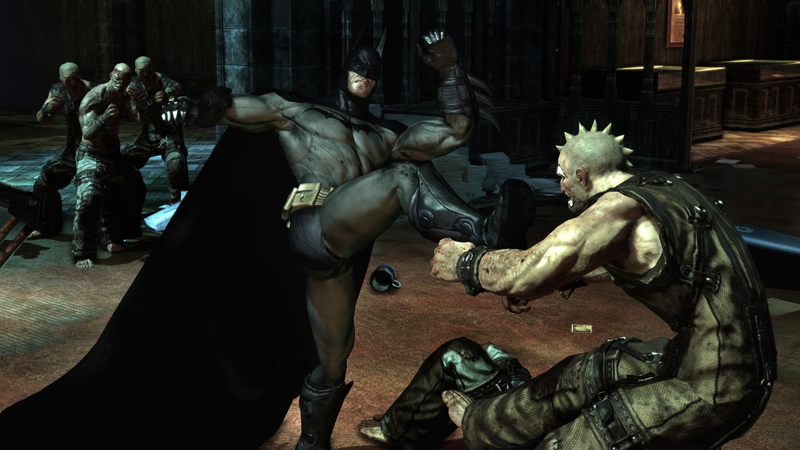 If there was a game out there which embodies the spirit of Batman more than Arkham Asylum, I haven’t played it. (In fact, I’ve never played any game featuring the Caped Crusader, but that’s besides the point.) The PlayStation 3 demo for Arkham Asylum hit the PlayStation Network store this evening and it took me completely by surprise. A lot of effort and love for Batman was showcased through this 1.1 GB demo making it one hell out of a demo. That trademark Unreal Engine 3.0’s “look” is in full effect with its stocky looking men and glistening surfaces. However, it’s not a knock against Arkham Asylum because it actually fits the mood. What is truly amazing was how they managed to model an attractive female using this engine — of course I’m talking about Harley Quinn. Along with Batman, the demo featured The Joker, Harley Quinn and Commissioner Gordon. The Joker and Ms Quinn were excellent recreations. Commissioner Gordon looked like he spent his life in the gym. And as for Batman? He reminded me of Bruce Willis — I accepted it and I’m sure many people will too. I’m also certain that people will accept the voice work. The voice actors from “The Animated Series” returned to reprise their roles. I love Mark Hamill’s Joker; it’s absolutely insane. From combat to presentation, Arkham Asylum was slick, smooth and detailed. Batman taking out a trio of thugs felt real. He wasn’t moving with ninja-like speed, but with the precision and strength of a man who knows his hand-to-hand combat. It’s satisfying to watch albeit easy to pull off. The same easy one button execution also applies to his signature Bat moves ranging from hanging upside down to swooping down and knocking out unsuspecting foes. I’m hoping it’s just the demo and that more challenging combat will be waiting in the retail release. This Batman: Arkham Asylum demo sits along side BioShock as one of the few demos which actually does the game a service. It’s incredibly well made, it makes great use of the source material and it’s releasing well before the holiday rush. What more can you ask for? Okay lots, but if you’re looking for the best Batman game to date; give this one serious consideration. I certainly will. Batman: Arkham Asylum releases August 25, 2009 on PC, PlayStation 3, and Xbox 360. For more information, visit the official website. I wish people would learn more about basic game design, before making such ignorant statements. The engine has NOTHING to do with the design/look of the character models. Mirror’s Edge, Lost Oddyssey, Mass Effect, The Last Remnant, Borderlands, Fairy Tale Fights, Magna Carta 2…ALL unique, beautiful games, with great character details. BTW, if you didn’t think the female characters in Mass Effect, Mirror’s Edge or Lost Odyssey looked…FEMININE….then you need a REAL girlfriend to compare them to. Totally agree that not all Unreal Engine 3.0 games look alike, but Batman, Mass Effect, Lost Odyssey and even Mirror’s Edge have this look that easily distinguishes them as Unreal Engine 3.0 games — and that’s what I’m alluding to. The only game game which separated itself from the pack is Borderlands. Unreal engine is a pathetic piece of past gen junk. I agree with no_style. As soon as it loaded you knew for a fact is was built on Unreal 3 engine. Its a great engine, and I believe Arkham asylum includes some of the new upgrades that epic recenrtly included. It is excactly the right sort of engine for this game and provides the right engine for the game developers to get the effects and look that makes Arkham assylum look how you think it should. Gears would not have been the game it was without the look created using the engine. same goes for bioshock. and THWIP71, I think you need to lay off the coffee m8. I dont believe he was talking about textures or character designs but the effects that the unreal 3 engine creates, which are all instantly recognisable. be it water effects or lighting. and No_style , yeah the demo was awesome, a little short for me but I suppose its only a couple of weeks till release. but yea i agree the demo is awesome cant wait till the games out. this will be the first comic book to game adaption that is actually above par. finally a game that lives up to the comic books. It is 1.1GB, maybe ur one with the EU copy. yea well AU copy if its the same. but well worth it, short but sweet.